Welcome to my blog!! I am so glad that you stopped by. Today I am sharing a Valentine's themed project and hopping with the ScrapbookPal design team. If you just happened upon my blog and want to join us for the fun, you can start at the ScrapbookPal blog to get all the details. If you haven't heard of ScrapbookPal before, you are in for a real treat. They have great prices and free shipping on all orders over $25.....plus they ship really fast so, if you are like me and you want to have your product in your hands quickly, ScrapbookPal makes that happen. In order to participate and be eligible for the awesome prize (yes, I did say prize...and it is awesome), you need to hop along to each of these wonderful ladies blogs and leave comments along the way. Hop on back to the ScrapbookPal blog, become a follower if you aren't already one, and leave a comment under the blog hop post saying that you have completed the hop and that you follow the ScrapbookPal blog. The awesome prize up for grabs is sponsored by ScrapbookPal.....it is a Cricut cartridge of the winners choice from in-stock cartridges. So cool!! You have until Sunday night to complete the hop to be eligible. I hope you are gaining inspiration along the way. It would be great if you wanted to become a follower on my blog, but it is not a requirement to win a prize. If you want to browse around my blog a bit, I do have some giveaways going on this week as I try to get my new scrapping room put together. Cute project! I love the way you cut out the heart so we can see the goodies inside! Yumm!! What a sweet little treat holder! And I LOVE your peg board organizing idea! And I just discovered your blog on this hop and am now a follower - so very nice to meet you! I love that little treat holder with the heart window. Great idea. I just became a follower too. I love scrapbookpal. Ok, now I must have the sweethearts cart!! That is too cute!! Thanks! Mmmmm, chocolate! Super cute box and tag! Thanks for sharing! Very cute... I love the tag. I became a follower, I love your blog!! I love your project. I wish I had the Sweetheart cart. What a cute project.....love it! 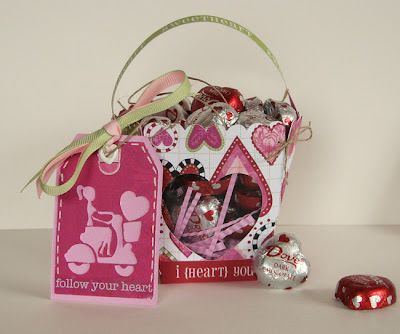 Very cute.... love your valentine day projects. Love the tag & the bag is fantastic! Cute ideas, I think my daughter and I will make some of those cute bags for her classmates! How clever, using the Cricut packaging to cover the opening. Thanks for making my first blog hop so inspiring! So very cute! Love you kid area! As for your Valentine project, very cute, just hand over the chocolate! Very cute tag and bag set! TFS! So cute....will make a great Valentine gift! Your tag is lovely. I don't recognize the moped cut. I'll need to go find that. I love your treat bag. I've been wanting Cindy Loo for some time now!! One of my favorite blogs!!! So cute! I love the tag. Love your blog. I love it, Amy. The tag especially makes me want to get the Sweethearts cart! The bag is adorable! Cindy Loo is on my wish list! I'm now a follower also! I love the gift! I am going to be doing something similar for my valentine and friends. But I am going to fill mine with home made fortune cookies! thanks for the inspiration, would love to share this to my son so that he will also love art.